Without some level of institutionalisation or other means of enforcement, national commitment to regional trade integration is bound to face some challenges. Accordingly, transnational trade is obviously inhibited when the validity and enforcement of contracts, obligation and rules cannot be guaranteed beyond the term of office of an administration. Thus Member States' commitment to the work of institutions within a regional economic community like SADC is critical for the full implementation of the SADC Treaty and its Protocols. The Protocol on Trade has been hailed as the most important for integration in SADC. This paper will indicate that institutions are essential drivers of organisations and their role in regional integration is therefore very important. However under the current legal and institutional framework, the SADC regional integration agenda faces major challenges of implementation. SADC institutions are not capable of completely fulfilling their legal obligations, although in some instances the lack of fulfilment was clearly a result of the legal instruments themselves being incomplete and needing further reform. Economic integration requires the delegation of power to a supranational body entrusted with the task of safeguarding the interest of both the supranational entity as well as that of the individual Member States. The principal organs driving regional economic integration in the SADC are the Summit, which is made up of Heads of State and Government; the Troika; the Council of Ministers; the Integrated Committee of Ministers; the Tribunal; SADC National Committees; Standing Committee of Officials; and the Secretariat. The SADC Tribunal was the only new institution provided for under the Windhoek Treaty. For the purposes of this paper only the important institutions relevant to regional integration will be discussed. Each institution will be discussed according to the provisions of the Treaty and the mandate of the Protocol on Trade. The role of each of these institutions in SADC regional integration is also analysed. Special Summit meetings are also called to discuss issues of emergency and whenever there is a need. The Summit is a critical institution that has to approve policy before it is considered for adoption into law, for example protocol formulation. Even the judgements of the SADC Tribunal have to be referred to the Summit, since it is the only body that can sanction the findings of the Tribunal.47Many commentators have placed the hope of SADC integration on the political willingness of regional leaders. In future, the SADC's ambitious trade timetable needs to be matched by the political will to meet the deadlines in order to restore the organisation's flagging credibility. This means that this body has to show political willingness to implement the SADC integration agenda. Unfortunately this is lacking, as regional leaders are reluctant to surrender state sovereignty for the benefit of the region. Regional integration is a priority for the Summit. The SADC Trade Protocol itself is evidence of this need. In 2006, the Summit agreed to convene an Extraordinary Summit to discuss regional integration matters.48The Extraordinary Summit was held in South Africa and the SADC Heads of State and Government reviewed the state of integration of the region and resolved to accord this process high priority, bearing in mind the key milestones approved by the Regional Indicative Strategic Development Plan (RISDP). The priority accorded to regional integration at the Summit suggested that political momentum seems to have developed in recent years. Subsequently, the Ordinary Summit held in Lusaka in August 2007 focused its attention on the imperatives to deepen regional economic integration and fast-track implementation of infrastructure development in the region. From there on the Summit has been on target in trying to implement the RISDP, as evidenced by the implementation of the FTA in August 2008.49More functions of the Summit are enumerated under Article 10 of the SADC Treaty. The above discussion has emphasised the importance of the Summit in SADC economic integration. As the supreme policy-making institution, it has to promote economic integration objectives if deeper integration is to be realised. The leadership of the Summit has not always been clear. As part of its structure the Summit is led by a chairman and vice-chairman elected 'for an agreed period' and 'on the basis of rotation'.50However, the election procedures have not been specified, which has left the Heads of State and Government some latitude in the selection of the political leader of the organisation at any particular time. This leadership role is not necessarily taken on by the persons best qualified to guide the SADC agenda at any particular time; thus, regional integration efforts may be either weak or robust depending on the calibre of the current leader. This problem is not unique to the SADC, and it could be resolved by amending the SADC Treaty and giving more power to the Secretariat, which would be in charge of the daily running of the organisation. Another weakness in the role of the Summit in regional integration is that, since the Heads of State and Government cannot meet as often as there are binding decisions to be made, the efficiency of the organisation is seriously compromised. It is now very doubtful that the Summit will in future make decisions that are not favourable to some Member States but favourable to the region. According to Erasmus the consensus nature of decision making by the Summit gives the member in violation of its obligations veto over any sanctions.56This point can be illustrated this way; as the Summit reaches its decisions through consensus, a Member State may decide to protect its individual interests by voting against a policy. By so doing it will prevent the achievement of the required consensus. This is a major flaw in the system.57Given this scenario, the critical decision-making processes affecting regional integration are subjected to uncertainties to some extent. There is a need to deal with these uncertainties. One way of dealing with these uncertainties is to amend the provisionsof the Treaty in order to reflect who should be in charge of making sure that Member States implement their SADC Treaty obligation. It is clear from this discussion that the Summit is playing a pivotal role in SADC regional integration at the moment and in the foreseeable future. However, as an institution of the SADC the Summit has not garnered enough political will to draw the line between the individual interest of Member States and that of the region. Thesechallenges will have to be addressed if this organ is to remain the backbone to regional integration in the region. The Extraordinary Summit decided to formalise the practice of a Troika system, consisting of the Chair, the incoming Chair and the outgoing Chair of the SADC, which has been effective since it was established by the Summit in Maputo, Mozambique in 1999.59According to Article 9(1), the Troika also applies with respect not only to the Summit but also to the Organ, the Council, the integrated Committee of Ministers and the standing Committee of Officials.60Other members may be co-opted into the Troika as and when necessary.61This system has enabled the organisation to execute tasks and implement decisions expeditiously, as well as to provide policy direction to SADC institutions in periods between regular SADC meetings, as it is easy to convene.62This is a key institution responsible for decision making,63facilitating the implementation of decisions64and providing policy direction.65The Troika has been very functional with regard to the issues pertaining to the resolution of the Zimbabwean crisis,66as well as the instabilities in the DRC and Madagascar. The Troika is an important institutional organ that has to keep the integration agenda on track during its frequent meetings. Strategically, it plays a critical role in meeting more often than the Summit and its decisions and work are closely linked to the Summit. The main weakness of the Troika is its subordination to the Summit, as its resolutions can be nullified by the Summit. For example, important resolutions on Zimbabwe made at the Troika Summit of the Organ on Politics and Defence held in Livingstone, Zambia,were not endorsed by the Summit, which met the following month.67The Summit merely noted the resolution; a move that did not convey any legal significance. It is evident in the character of the Troika that the SADC intended to foster the continuity of SADC activities. The idea of putting together an organ consisting of the current, outgoing and incoming Chairs is an ideal strategy for promoting continuity and is critical for the regional integration process, which requires an organisation that embraces change. In its practical work, the Troika will be an ideal vehicle for the full implementation of the RISDP. Another advantage for the regional integration that can be derived from the Troika is its ability to involve as many stakeholders as possible for regional integration within the SADC Treaty. Regional integration is a process that is highly likely to succeed if there is buy-in from as many stakeholders as possible. The function of the Council of Ministers should remain as provided for under Article 11 of the Treaty. In general, the Council serves as the engine room of the SADC in that it develops and implements the common agenda of the SADC.69This Council consists of Ministers from each Member State, usually from the Ministries of Foreign Affairs and Economic Planning or Finance.70The Council has an important responsibility to oversee the functioning and development of the SADC and ensure that policies are properly implemented. Under the new structure it is recommended that the Council should meet four times a year.71Since the RISDP is still without legal basis, the Council has to facilitate its implementation and take stock of its progress in its frequent meetings. Consequently, the Council of Ministers is the direct link between the SADC and Member States, and these Ministers are mandated to express Member States' policy positions on regional matters. At the same time they play a critical role of promoting SADC initiatives in their various countries. This is critical since regional integration that lacks popular support from the ordinary citizens of Member States is bound to fail. The Integrated Committee of Ministers is made up of at least two ministers from each Member State with a mandate to meet at least once a year. This is a new institution aimed at ensuring proper policy guidance, coordination and harmonisation of cross-sectoral activities. The Integrated Committee of Ministers oversees the activities of the four core areas of integration, notably Trade, Industry, Finance and Investment;78Infrastructure and Services;79Food, Agriculture and Natural Resources;80and Social and Human Development and Special Programmes,81including the implementation of the Strategic Plan in their areas of competence. These are key area for SADC regional integration. For the purpose of emphasising the importance of this Committee, it is important to realise that the issues of trade and integration are first highlighted in the Committee. Thus, the Committee takes an initiating role in influencing policy on regional integration. The Committee comprises at least two Ministers from each Member State and should be responsible to Council. The representative nature of the Committee allows it to enjoy the support of all Member States.82Member ownership of SADC programmes is the key to regional integration. The main challenge of this institution is that its decisions are made by consensus and are reported to the Council.84The weakness of requiring consensus has already been emphasised during the discussion of the Summit. The Standing Committee of Officials forms a technical advisory committee to the Council. It is made up of one permanent secretary from the ministry of the Member State which serves as the SADC national contact point. This makes this committee an important and strategic channel of information dissemination from the SADC to the Member States' national contact points; a feature that promotes awareness for economic integration among Member States. They meet at least four times a year with their decisions being made by consensus. Their frequent meetings can serve as an expediting tool for the SADC regional economic integration agenda, which has often been accused of a slow pace. Their main function is also to process documentation from the Integrated Committee of Ministers and report to the Council. The SADC Tribunal is currently not operational after the decision to suspend it by the 2010 Windhoek Summit.87The 2011 Summit put in place a further moratorium barring the Tribunal from accepting any new cases, even those not related to the Campbell case. The Summit also paralysed the Tribunal by not renewing contracts for sitting Judges or replacing them. Thus the Tribunal would be unable to accept new cases since it did not comply with the requirements for its composition as prescribed by Article 3 of the SADC Tribunal Protocol.88Notwithstanding the current status of this judicial forum, the rationale for this discussion is to emphasise the legal mandate given to the Tribunal by the SADC Treaty and the way in which that mandate relates to regional integration. The Tribunal of the SADC is provided for under Article 16 of the Declaration and Treaty Establishing the SADC of 1992. The Community's members approved the Protocol required to set up the Tribunal in the year 2000. Finally, the Protocol entered into force with the signing of the Agreement Amending the Treaty of the SADC in August 2001. This amendment signalled renewed energy in the integration of the community, making the Protocol on the Tribunal an integral part of the Treaty and thus automatically applicable to all Member States. The Tribunal shall be constituted to ensure adherence to the proper interpretation of the provisions of the SADC Treaty and subsidiary instruments, and to adjudicate such disputes as may be referred to it. The review process was required to address inter aliathe jurisdiction of the Tribunal; the interface between Community law and national laws in the SADC; the mandate of the existing appeals chamber of the Tribunal; the recognition, enforcement and execution of the Tribunal's decisions; the lack of clarity in some provisions of the SADC Treaty and the Tribunal Protocol; the tendency by Member States to give primacy to domestic laws or jurisdiction over SADC law; and the reluctance of Member States to relinquish some aspects of their sovereignty to the SADC.101However, after the review was completed, the SADC justice ministers and attorney generals questioned anew its fundamental elements and then initiated a new, partisan review. This led the June 2011 Summit to suspend all work for the Tribunal, going so far as to stop it from hearing new cases unrelated to the Campbell case. The decision not to reappoint or replace the Tribunal's 10 judges rendered the Tribunal inoperative until at least August 2012. The remaining four judges102of the SADC Tribunal described this move as amounting to the dissolution of the Tribunal altogether. This is contrary to the findings of the review process, which had even found that the Tribunal's ruling was legitimate and suggested a need for the further strengthening of the Tribunal. This discussion demonstrates that political organs of international institutions are vital for the creation of a culture of compliance.109The actions of the Summit are actually illegal since, without amending the SADC Treaty and Protocol on the Tribunal, the Summit has no power to restrict the Tribunal's jurisdiction or to overrule the protocol. The suspension of the Tribunal as a result of a Member State's dissatisfaction with the decisions of the Tribunal casts doubt on the acceptability of decisions of supranational institutions by SADC Member States. The SADC Secretariat is the principal executive institution of the SADC responsible for the strategic planning, coordination and management of SADC programmes.116It is headed by an Executive Secretary and has its headquarters in Gaborone, Botswana.117The Extraordinary Summit agreed that the Secretariat should be strengthened in terms both of its mandate and of the provision of adequate resources for it to be able to perform its functions effectively as provided for under Article 14 of the SADC Treaty and in accord with the Abuja Treaty. Currently the Secretariat is involved in a robust exercise of recruiting additional staff that will help speed up the process of integration. The SADC Secretariat's main functions are to spearhead the strategic planning and management of the SADC programme.118It is also tasked with implementing the decisions of the Summit and Council. This is a key responsibility with specific reference to the SADC's regional integration agenda, and the implementation of the FTA, customs union and common market falls within the mandate of the Secretariat. The SADC Secretariat will be called upon to vigorously pursue SADC-related objectives in the negotiations and implementation of the SADC, EAC and COMESA Tripartite FTA. The infrastructure problem has been identified as one of the challenges for regional integration in the SADC. The cooperation and partnership between the Government of the Federative Republic of Brazil and the SADC is intended to take the following forms: the formulation and implementation of programmes and projects in areas of common interest, the exchange of information, the undertaking of internships and technical missions, the organisation of seminars, meetings and trainee programmes, as well as the development of research studies on areas of common interest. All of these aspects touch on technology transfer, a critical area for development in Southern Africa. On the same day the SADC also signed an Agreement with the Community of Portuguese Speaking Countries (the CPLP) on the Provision of Financial Support for the Translation of the Content of the SADC Website into Portuguese. In terms of the Agreement, the CPLP will provide the financial support for the translation of the content of the SADC website into Portuguese.124Such a translation will be useful for the SADC since Mozambique and Angola are Portuguese-speaking countries, whose optimal participation in SADC programmes has always been hampered by the language barrier. Deeper integration will be enhanced through this effort. The Secretariat plays a critical role in the promotion and harmonisation of the policies and strategies of Member States.125The task of exercising this mandate is important at this critical phase of the FTA and customs union, as these stages require that Member States find a common ground on the elimination of all trade barriers for the FTA, as well as a compromise on a common external tariff (CET) acceptable to all Member States. The common external tariff will be a challenge, since the lowest level in existence in the proposed CU has to be adopted. Mauritius tariffs have already reached zero, hence the CET cannot go beyond that. With most SADC members still relying on tariffs as sources of revenue, a common ground will be difficult to find and an agreement can be achieved only once individual states' policies are harmonised. Common strategies to achieve common objectives are the starting point that the Secretariat is tasked to promote. The Secretariat has also been given a mandate to drive appropriate strategies for self-financing and income-generating activities and investments, as well as undertaking research on community building and the integration process. [t]he ASEAN Secretariat is understaffed and underfunded, has no open recruitment, staff seconded by member states. The governments of SADC Member States still fill most positions within the Secretariat by way of secondment. When jobs are advertised, interested candidates have to apply through each Member State's national contact point129and applications made directly to the Secretariat are not considered. Supranational institutions are largely independent of individual Member States and they are vested with decision-making powers which bind Member States. This is not the case with the SADC. Evidence from the dissolution of the SADC Tribunal clearly shows that SADC institutions are not independent of the influence of Member States. Furthermore, key institutions within the organisation should work in harmony and exercise their powers in a manner that reflects the common agenda of the regional body. The SADC Summit is clearly playing a bullying role on the institutions which report to it. The current SADC setup creates institutions which only resemble supranational institutions. The pertinent outcome of this analysis is that the SADC institutional framework is not independent of the influence of Member States. The requirement of consensus in decision making for all institutions also weakens the organisation. These institutions therefore cannot be fully relied upon to propel the SADC towards deeper regional integration. Firstly, the discussion of the different treaty provisions giving the SADC's institutions a mandate to pursue regional integration indicates that the organisation is rules based, and a deliberate effort should therefore be made to ensure respect of its rules.131The Tribunal has confirmed certain aspects of this rules-based system.132The shortcomings of the SADC Treaty are mostly evident from the excessive powers given to and employed by the Summit. It is recommended that the Summit's powers be limited. It must not be possible for the Summit to undermine the efforts of the other institutions. This paper has identified the Tribunal as the most appropriate institution to be mandated to keep the Summit in check, instead of which the Summit has actually rendered the Tribunal inoperative. It is recommended that the Tribunal be reinstated in order to resume its role as the custodian of the rule of law in the SADC. The issue pertaining to the monitoring of the implementation of SADC Treaty provisions would also be enhanced by the reinstatement of the Tribunal, since the Tribunal was "constituted to ensure adherence to and the proper interpretation of the provisions of the SADC Treaty and subsidiary instruments and to adjudicate upon such disputes as may be referred to it". Its decisions are final and binding.133Thus the SADC Tribunal is ideally placed to monitor the powers of other institutions such as the Summit. The Tribunal should play the equally important role of making sure that SADC institutions implement the SADC Treaty provisions that they are charged with. SADC law can address the problems of poor implementation and the insufficient monitoring of compliance by imposing sanctions on members who "persistently fail, without good reason, to fulfil obligations assumed under this Treaty" or when they "implement policies which undermine the principles and objectives of SADC".134Applying these legal provisions could have easily resulted in the imposition of sanctions on Zimbabwe for having failed to comply with the SADC Tribunal's rulings on its human rights violations. It is part of the operational challenge in the SADC that compliance with international obligations is not being properly monitored, and there are no effective ways of enforcing sanctions for non-compliance. It is also recommended that the registration of Tribunal judgements in Member States be performed in order to be able to give domestic effect to the rulings of the Tribunal. There is a need to create more awareness in SADC Member States parliaments of the need to adopt international agreements. For example, the South African Constitution makes specific provision for the responsibility of the national executive in signing international agreement.135This is in line with the 'general undertakings' listed in Article 6 of the SADC Treaty, that provides that Member States "shall take all steps necessary to ensure the uniform application of this Treaty" as well as "all necessary steps to accord this Treaty the force of international law". This means that Article 6(5) prescribes that the Treaty needs to be given effect within the Member States. It is recommended that Member States comply with this requirement, and in cases where the relevant national legislation is not available, new legislation may be required. Member States need to respect these provisions. This paper has demonstrated that SADC institutions are not capable of completely fulfilling their legal obligations, although in some instances the lack of fulfilment was clearly a result of the legal instruments themselves being incomplete and needing further reform. The Summit's failure to respect the judgments of the Tribunal is a clear example. The de facto suspension of the Tribunal subsequent to Zimbabwe's non-compliance with its orders creates the impression that SADC members are not committed to regional integrationunder the auspices of the SADC.137It can also be concluded that SADC Member States neglect their legal obligations to fulfil the obligations of the Treaty. The full implementation of the 2008 FTA and the enforcement of the judgments of the Tribunal would contradict this statement, if they were to take place. Thus, under the current legal and institutional framework, the SADC's regional integration agenda faces major challenges of implementation. The SADC's legal arrangements should be seen as constituting binding and enforceable law which must be implemented before national and regional courts. 1 Maruping "Challenges for Integration". The burden of history discussed here refers to past years of colonialism, underdevelopment and economic hardships that seem to have worsened even after the independence of the whole region. 2 Evans, Holmes and Mandaza SADC 12. 4 See generally Ferrari and Pollicino 2011 Comparative Law Review. 5 Kiljunen European Constitution in the Making 21-26. 6 Erasmus 2011 SADC Law Journal 17. 7 Erasmus 2011 SADC Law Journal 17. 9 Hereafter "RTAs". The members of the SADC are Angola, Botswana, Democratic Republic of Congo, Lesotho, Malawi, Mauritius, Mozambique, Namibia, Seychelles, South Africa, Swaziland, Tanzania, Zambia and Zimbabwe. The membership of Madagascar was suspended after a coup d'état by opposition leader Andre Rajoelena. 10 Hereafter the "SADC". For a historical background limited to up to 1985 see Abegunrin 1981-2 Current Bibliography on African Affairs 1-5. 11 Oosthuizen Southern African Development Community 17. See also Abegunrin "Southern African Development Coordination Conference" 36. The Southern African Development Co-ordination Conference was established in 1980 by the governments of Angola, Botswana, Lesotho, Malawi, Mozambique, Swaziland, Tanzania, Zambia and Zimbabwe, which was the forerunner of the Southern African Development Community (SADC), which was formed in Lusaka, Zambia, on 1 April 1980, following the adoption of the Lusaka Declaration (1980) by the nine founding member states. See also the Harare Memorandum of Understanding (1981). There was no treaty signed for SADCC. 13 Tsikata "Southern Africa: Trade, Liberalisation and Implications" 14. See also Gibb 1998 JMAS 287-306. 14 Khama 1979 Africa Research Bulletin 51-55. See also Gibb 1998 JMAS 287-306. 16 Olivier "Southern African Development Community" 15. 17 The SADC Treaty was signed at Windhoek, Namibia on 17 August 1992, entering into force on 30 September 1993. The Treaty was amended at Blantyre, Malawi in August 2001. A consolidated version of the Treaty and all its amendments can be accessed on the SADC official website (SADC Date Unknown http://www.sadc.int). 18 Article 14 SADC Treaty (1992). 19 Chapter 3, Aa 4 and 5 SADC Treaty (1992). 20 Article 6 SADC Treaty (1992). 21 Chapter 4 Aa 37 and 8 SADC Treaty (1992). 22 Chapter 5 Aa 9 and 16A SADC Treaty (1992). 23 Article 21 SADC Treaty (1992). 24 Article 24 SADC Treaty (1992). 25 Chapter 9 Aa 25-27 and Chapter 10 Aa 28-30 SADC Treaty (1992). 26 Article 32 SADC Treaty (1992). 27 Chapter 13 Aa 33-35 SADC Treaty (1992). 30 Jakobeit, Hartzenberg and Charalambides 2005 http://www.acp-eu-trade.org 12. 31 See generally Mattli 1999. The Logic of Regional Integration 3. 32 Afadameh-Adeyemi and Kalula 2010 Monitoring Regional Integration in Southern Africa: Yearbook 30. 33 Afadameh-Adeyemi and Kalula 2010 Monitoring Regional Integration in Southern Africa: Yearbook 30. 35 Article 10 SADC Treaty (1992). 36 Article 10 SADC Treaty (1992). The use of consensus by the Summit has compromised its functions, for example the issues surrounding Zimbabwe's refusal to accept the decision of the Tribunal ruling in the Campbell case. This means that for the decision to be endorsed by the Summit, Zimbabwe will have to support it. This was highly unlikely and it became clear that the Summit sided with Zimbabwe and suspended the Tribunal. 37 Ng'ong'ola 1999 Journal of World Trade 485-506. 38 Article 10(3) SADC Treaty (1992) empowers the Summit to adopt legal texts and instruments for the implementation of the Treaty. Some of the work can be delegated to the Council of Ministers. 39 Article 10(8) SADC Treaty (1992). 40 Article 10(5) SADC Treaty (1992). 41 Article 10(7) SADC Treaty (1992). 42 Article 8(2) SADC Treaty (1992). 47 Article 16(4) SADC Treaty (1992): "The Tribunal shall also have advisory jurisdiction at the request of the Summit or the Council of Ministers". 50 Article 10(4) SADC Treaty (1992). 51 Articles 10(8), 11(3)(6) and 13(6) SADC Treaty (1992). 52 Erasmus 2011 SADC Law Journal 130. 55 Erasmus Protection of Rights in SADC 3. 56 Erasmus Protection of Rights in SADC 3. 57 Erasmus Protection of Rights in SADC 3. 58 Article 9A SADC Treaty (1992). 59 SADC Date Unknown http://www.africa-union.org. 60 This wide scope means that the Troika is a flexible mechanism. This flexibility is evident in A 9.7, which gives each institution the power to create committees on an ad hoc basis. A 9.8 leaves the Troika of each institution to determine its own rules of procedure. 61 Erasmus Protection of Rights in SADC 3. 62 Erasmus Protection of Rights in SADC 3. 63 Article 9.6.1 SADC Treaty (1992). 64 Article 9.6.2 SADC Treaty (1992). 65 Article 9.6.3 SADC Treaty (1992). 68 Article 11 SADC Treaty (1992). 69 Afadameh-Adeyemi and Kalula 2010 Monitoring Regional Integration in Southern Africa: Yearbook 5. 71 Article 11(4) SADC Treaty (1992). 72 Article 2(3) SADC Treaty (1992). 73 Article 2(12) SADC Treaty (1992). 74 Article 2(11) SADC Treaty (1992). 75 Article 2(7) SADC Treaty (1992). 77 Afadameh-Adeyemi and Kalula 2010 Monitoring Regional Integration in Southern Africa: Yearbook 5. 78 Article 12.2.1 SADC Treaty (1992). 79 Article 12.2.2 SADC Treaty (1992). 80 Article 12.1.3 SADC Treaty (1992). 81 Article 12.1.4 SADC Treaty (1992). 82 Article 12.1 SADC Treaty (1992). 83 Article 12.2 SADC Treaty (1992). 84 Article 12 SADC Treaty (1992). 85 Article 13 SADC Treaty (1992). 86 Article 16 SADC Treaty (1992). 87 SADC 2011 http://www.swradioafrica.com. See also Van der Bosch 2011 http://www.globalissues.org. 88 Scholtz 2011 SADC Law Journal 197. 89 Article 3 SADC Treaty (1992). 90 According to A 16.2 SADC Treaty (1992), the composition, powers, functions, procedures and other related matters governing the Tribunal shall be prescribed in a Protocol, which shall, notwithstanding the provisions of A 22 of the Treaty, form an integral part of the Treaty, adopted by the Summit. 91 Erasmus 2011 SADC Law Journal 130. 92 Article 33 SADC Treaty (1992). 93 Article 33.2 SADC Treaty (1992). 94 Article 33.1 SADC Treaty (1992). 95 Article 10(8) SADC Tribunal Protocol (2008). 96 Article 16.5 SADC Treaty (1992). 97 Erasmus 2011 SADC Law Journal 130. 98 Mike Campbell v Republic of Zimbabwe SADC (T) 2/2007 (28 November 2008). 99 Ebobrah 2009 Afr Hum Rts L J 329. 100 Scholtz 2011 SADC Law Journal 197. 101 Scholtz 2011 SADC Law Journal 197. 102 These judges include the Tribunal President, Mauritius Chief Justice Ariranga Pillay and Justices Rigoberto Kambovo, Onkemetse Tshosa and Frederick Chomba. 103 Scholtz 2011 SADC Law Journal 197. 104 Afadameh-Adeyemi and Kalula 2010 Monitoring Regional Integration in Southern Africa: Yearbook 5. 105 Afadameh-Adeyemi and Kalula 2010 Monitoring Regional Integration in Southern Africa: Yearbook 5. 106 Scholtz 2011 SADC Law Journal 197. 107 Afadameh-Adeyemi and Kalula 2010 Monitoring Regional Integration in Southern Africa: Yearbook 5. 109 In terms of the organisational structure of SADC, the Summit is made up of Heads of State and Government and is the highest authority of the SADC. 110 Afadameh-Adeyemi and Kalula 2010 Monitoring Regional Integration in Southern Africa: Yearbook 5. 111 See Mondlane v SADC Secretariat SADC (T) 7/2009 (5 February 2010); Kanyama v SADC Secretariat SADC (T) 5/2009 (29 January 2010). 112 Saurombe Saurombe 2011 "The Southern African Development Community" 1-33. 113 Goode Dictionary of Trade Policy Terms 359. 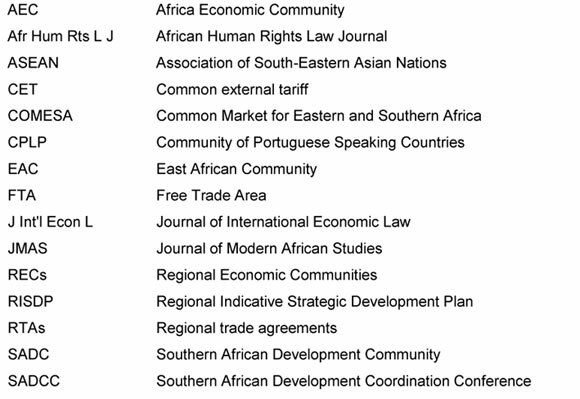 114 Erasmus 2011 SADC Law Journal 17-34. 115 Article 14 SADC Treaty (1992). 116 Article 14.1.1 SADC Treaty (1992). 117 Article 2.2 SADC Treaty (1992). 118 Article 14.1.2 SADC Treaty (1992). 119 Article 14.1.3 SADC Treaty (1992). 120 Article 14.1.4 SADC Treaty (1992). 121 Article 14.1.11 SADC Treaty (1992). 122 Article 14.1.7 SADC Treaty (1992). 123 Article 14.1.11 SADC Treaty (1992). 125 Article 14.1.8 SADC Treaty (1992). 126 Evans, Holmes and Mandaza SADC. 127 ASEAN Date Unknown http://www.asean.org. 128 Hafez Dimensions of Regional Trade Integration.61. 129 Article 16A SADC Treaty (1992). 130 Tallberg 2002 West European Politics 23-46. 131 Erasmus 2011 SADC Law Journal 130. 132 Erasmus 2011 SADC Law Journal 130; see also Mike Campbell v Republic of Zimbabwe SADC (T) 2/2007 (28 November 2008). 133 Article 16(5) SADC Treaty (1992). 134 Article 33(1) SADC Treaty (1992). 135 Section 231 Constitution of the Republic of South Africa, 1996. 136 Erasmus 2011 SADC Law Journal 130. 137 Scholtz 2011 SADC Law Journal 197.